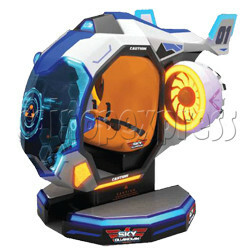 Sky Guardian Rotating Video Kiddie Ride (2 players) is an interactive video Kiddie rider game and an indoor redemption game machine, the cabinet is with fighting plane designs, with high definition video game, features with left and right rotating, rise and lowering movement during the game, reality flying effect for everyone. plays with air battle shooting gun, for two players to battle and defend the city game, beat enemy aircrafts to win tickets, attracts any kid to be a strong fighter pilot to shooting the enemy aircraft. Sky Guardian Rotating Video Kiddie Ride can be suitable for 1 ~ 2 children, comes with safety mat with sensors keeps spectators back, and with seat belts and emergency stop button, will be easier controlling by every operator.